This a Master Number Full Moon and the Stargate is OPEN! 11 is the Master Angelic number of inspiration, intuition, illumination, and embodied spiritual awakening for anchoring Heaven to Earth. 22 is the Master Builder number associated with the Christos Light of Mary Magdalene and Her Beloved Yeshua, to bring dreams to reality, and the Light of your higher self into Embodiment. 33 (when you add 11 + 22) is the Master Humanitarian number of resurrecting our Christ Light Divinity into our purpose/service/work and co-create with devotion to benefit All. This Gemini full moon, governed by the Element of Air, humbly illuminate our personal shadows and integrate them into the Light Codes coming forth for in this great portal from Nov 21 - 25. We are in a dualistic time of intensity and restoration as the upcoming 11/22/33 Gemini Full Moon is the apex for the influx of light code energies ushering into our 3D existence this November. These Diamond Light Christ Codes are incoming for the greatest embodiment of your soul self and our shared soul contract as a Family of Light to bridge Heaven and Earth. Surrender is key. Allow the Light Codes of the Heaven’s to bless your body, mind and soul. Give yourself this gift by opening to receive. This is simultaneously a descent into your innermost chambers to release the past and a celebration of gratitude for all the blessings of the past year. This paradox is a Gemini moon code revealing opportunities for multi-faceted communication cosmically, internally, relationally, emotionally and spiritually that can offer personal transformation and healing in our collective consciousness. This is a powerful time for expressing, amending, releasing or forgiving through communication. This communication may be with yourself or others from the past (including your ancestors). In this dualistic medicine of Gemini, it is also the time for us to gather and rise in the power of our sovereignty and communicate our gratitude, compassion and empathy for other, along with our sacred desires through prayer, song, dance, words and actions. When we direct the power of our mind's intentions through the lens of the heart by giving thanks we activate healing and transformation within and all around us, birthing into being the world we want to live in. This full moon is also known as the Shaman’s Moon. Burn it: Write a list of the communication/thoughts that are happening inside your head that you are ready to shift. Beliefs, stories, habits, all that you wish to leave behind while we are in the Dark time of the year. What are you letting go of? Free it up. Give it voice. Let it out. Let it go and burn it (safely) with a candle or campfire or fireplace. Then proceed to ritual below. 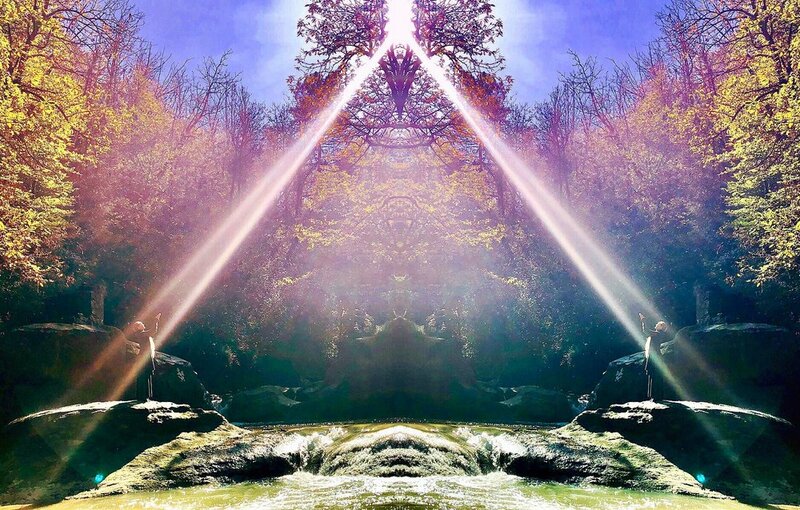 We welcome you to join us for a special free ceremony to ground in the amplified Diamond Light / Rainbow Codes in support of embodying your soul self, your mastery and mission on Earth at this time and our collective mission as a Family of Light birthing a Golden Age. As great shift is upon us, we shall commune with the empowering Feminine Christ presence of Beloved Mary Magdalene and the Seraphim Angels to ‘build’ our angelic rainbow light bodies in advocacy of your sovereign agency, psychic protection and magickal destiny. Posted on November 21, 2018 by Goddess Rising.